A triptych canvas is a three-panel canvas with one image split into three parts. You can see these splits in our online preview using our easy to use online design system. Our team of design experts will make sure the final installation looks great. 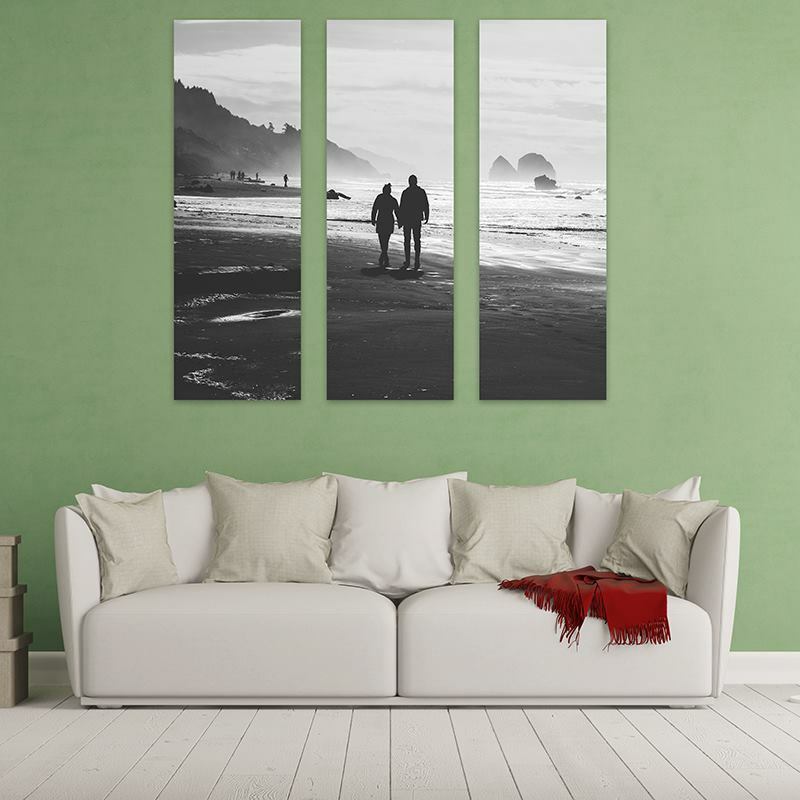 Triptych canvases make fascinating wall art pieces and beautiful home decor at attractive and affordable prices. As with all of our canvas prints, we use a special Dye Sublimation process which is what the professionals use. As a result, your canvas print is of the highest quality and will not fade, crack, or break over time. We guarantee your canvas prints will last a lifetime! The quality was excellent and shipping from the UK was really quick. the Panels came out great and it looks amazing. service was so fast we received it faster then we thought. will def. order from you again. Thank you! Style of mounting hardware provided not best for achieving plumb hanging of frames. Quality otherwise excellent. I NEVER leave reviews but Bags of Love deserves it. The photo came out perfect, the price was even better. I looked for a canvas that big forever and couldn’t find one under $300, but Bags of Love was more than half that price! Some things to watch out for are the crop panel cuts - i.e. where the breaks in your picture will occur. You can test this in our preview feature using our easy to use online design system. Our expert design team will manage and prepare the images in the best possible layout to make sure your original image is not lost when split into three. Here are the best sizes and fits for triptychs, working with the common aspect ratio of most digital cameras as well as popular print sizes. Each canvas comes 1" deep, meaning it sticks out 1" from the wall. Alternatively, we do also sell Diptych 2-Panel Split Canvas Prints if that better suits your wall space or design. If you have a preferred size that is not shown on this list, please contact us and we can work with you to create a size that fits your needs. Each set of 3-panels come with mirror wrapping on the canvas being standard. This means that if you place the panels right next to each other, the image will be a perfectly complete image when looking straight-on. Generally, when hanging your Triptych panels, there is at least a 1" gap to create a professional-looking design for any wall space. We use digital canvas printing to lock in the color, then trim the fabric to size, mounting your split canvas prints by hand to the stretcher frames. We will mirror wrap the image to stop there being a white border around your print. This means that each edge of your canvas will have the image you have uploaded mirrored to wrap around the edges of the canvas. Split canvas paintings are the perfect way to exhibit your own creative flair. Add triptych three canvas wall hangings to your portfolio and give your art a dynamic edge. Some things to watch out for in your design are the crop panel cuts i.e. where the breaks in your picture will occur, but you can clearly preview this when designing. Our sizing options display the overall 3 frame size – from the start of the first panel to the edge of the third panel – as well as the individual panel sizes. If you have a bespoke sizing request, please get in touch. For artists and photographers, there’s the option to print your own website URL for reselling purposes, or if you’re buying this as a personalized photo gift, you can remove our Bags of Love website URL so they don’t know where you’ve bought it from. Recently got married? Treasure the special day and have your most-loved photograph printed onto triptych canvas posters. In full color or artistic black and white, this is a unique way to celebrate the start of your married life together. Panoramic shots of the beach or city skylines look fabulous as multi-canvas prints. Hang them above your bed and let dreams of tropical sunsets and romantic holidays wash over you as you sleep.